The ODU AMC® product portfolio was created to improve the capabilities of the next generation intelligent soldier systems. ODU AMC® and ODU AMC® High-Density are advanced miniature connector solutions for soldier communication systems that require significant weight and space reduction such as: helmet mounted-camera, radio, headset, GPS, battery pack, computer/PAN, wrist-worn displays or rifle mounted systems. The ODU AMC® High-Density connector series offer high performance data transmission, high reliability and easy handling. The product portfolio includes a USB 3.0, USB 2.0, Ethernet CAT5 and an HDMI 2.0 option. The USB 3.0 data transmission rate is up to 5Gbit/s, the USB 2.0 data transfer up to 400Mbit/s, the Ethernet CAT5 data transfer rates up to 1Gbit/s and the HDMI 2.0 data transfer rates up to 8.16Gbit/s. 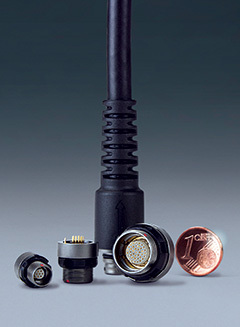 Providing significantly reduced weight and various combinations of interface cable solutions, and in shell diameters as small as 10mm up to 18.5mm (40 contacts), the ODU AMC® High-Density includes numerous high density signal configurations and tailored versions for power (up to 15A) and data transfer (USB 3.0 with 5A power) in a very compact package.